National Library of Medicine Director Donald A.B. Lindberg, MD will retire at the end of March 2015, after more than 30 years leading the world’s largest medical library. 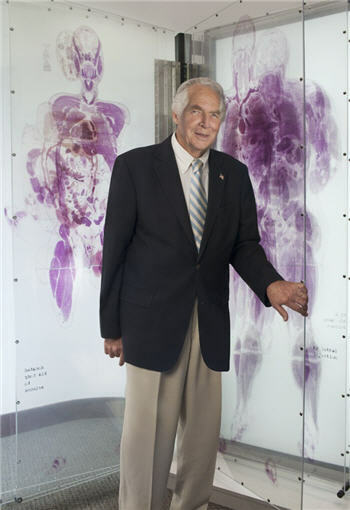 Dr. Lindberg began his career as a pathologist. He started applying computer technology to health care in the 1960s while at the University of Missouri. He was a professor of pathology and director of the Information Science Group at the University of Missouri, Columbia, when he was tapped to become NLM director. His contributions to the field of biomedical informatics extend well beyond NIH. Dr. Lindberg was a founding member, and the first president of, the American Medical Informatics Association (AMIA). He also was one of the founders of the American College of Medical Informatics, which is now an elected body of fellows within AMIA. “We are deeply grateful for his service and support of the biomedical informatics community,” AMIA president and CEO, Doug Fridsma, MD, PhD said in a statement posted on AMIA’s website. “He was an advocate for informatics well before it was popular, and his leadership has touched nearly everyone in our field.” In 2005, AMIA honored Dr. Lindberg by establishing the Donald A.B. Lindberg Award for Innovation in Informatics. During his time at NLM, Dr. Lindberg also led several interagency programs. In 1992, he became the first director of the National Coordination Office for High Performance Computing and Communications in the President’s Office of Science and Technology Policy and in 1996 was named by the HHS Secretary to be the US National Coordinator for the G-7 Global Healthcare Applications Project. Those posts, he said, hopefully positioned the Library as both a national and international model of information innovation. NLM’s mission of making high quality health information available to everyone broadened under Dr. Lindberg’s leadership. The scope of the National Network of Libraries of Medicine expanded and the Library entered into longstanding and successful partnerships with minority-serving institutions, tribal and community-based organizations, and the public health community. His years at the Library included two major milestones, NLM’s 150th and 175th anniversaries. More recently, he presided over NLM’s “Voyaging to the Future” symposium, which looked back at the library’s last 30 years and looked ahead as it begins its next long-range planning effort. November 18, 2014 in People.